In response Prof Peter Hartley put forward the suggestion for a Summer community-led pop-up chat. What’s this you might ask?! 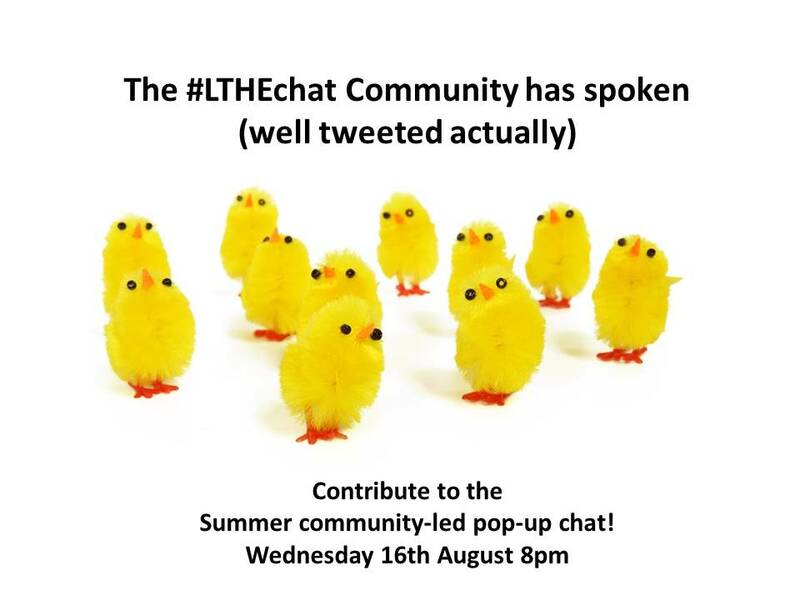 Well it’s a tweetchat where you the #LTHEchat community suggest themes and then vote for the top theme. Once decided you will then suggest the questions for this theme. open and share a Google doc with a deadline which allows everyone to suggest a main theme for the chat and vote on others’ suggestions. We will kick it off with a few suggestions. at the first deadline – 8th August – confirm the top theme and issue a new doc with a deadline which invites questions on that theme. run the chat at the agreed time and date – 8-9pm on 16th August. As everyone has the theme and questions, everyone can facilitate! Don’t you just love it when a plan comes together?! The #LTHEchat community has worked together to choose and vote on a topic and a collection of questions. Some students feedback negatively on the ‘flipped classroom’ teaching style. Is the answer blended delivery or improved flipped classroom? • Q4 How do you sell a flipped or blended learning approach to your students? Below is how it was organised. Well done everyone. Put Wednesday 16th August 8pm in your diary! Add your suggestion for a main theme to the table in this Google Doc. If the theme you like is already there, add your vote to the right hand column. Please complete this by Tuesday 8th August. Take a look at the chosen theme and contribute questions for this topic to the table in this Google Doc. Please complete this by Monday 14th August. We do hope you will join us from where ever you are – at home or chasing the sun! Until then follow @LTHEchat and #LTHEchat for updates. This entry was posted in community and tagged community-led, un-chat. Bookmark the permalink.